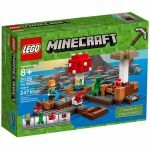 LEGO Minecraft is a licensed LEGO play set based on Minecraft. 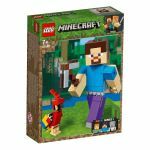 The theme is designed to provide an immersive play experience to fans of the popular video game. 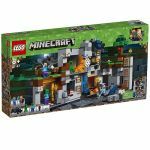 There are 14 sets available under this theme, including the normal LEGO scale sets, and the "Micro World" sets. 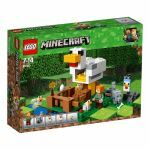 The earlier LEGO Minecraft sets released were the "Micro World" sets, which feature a group of interlocking scenes, a minecart track, underground rivers, and the player character, Steve. 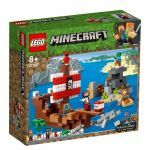 LEGO builders can enjoy playing out Minecraft adventures with the characters and unique items included in the Minecraft play sets. 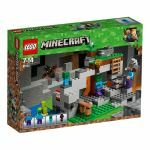 The normal LEGO Minecraft sets also have a wealth of authentic details that highlight the fun of playing Minecraft. The sets have brick-built locations that play up the blocky aesthetics of the successful video game. 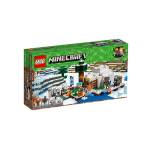 The sets also have base plates that allow for inter-connectivity with other LEGO Minecraft play sets. 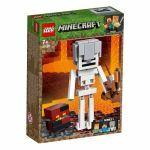 The sets feature at least one mob, have a cave with different ores, and include a farm with sheep, cow, and skeleton. 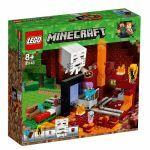 What makes these themed sets unique is that LEGO worked with Minecraft fans, in what the company calls the co-build project to crete the new series of sets that offer an entirely different design compared with the previous sets. 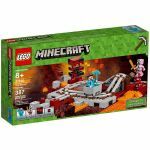 New sets released by LEGO under this line include Skeleton Attack and Bedrock Adventures and the Skull Arena.